I was thinking about Trevor‘s comment regarding “keep showing up” today. Rule 1: Show up ready to learn and give good effort. Rule 2: Keep showing up. Show up more than anyone else. If you don’t feel like going, see rule 2. Rule 3: Put in the work and measure your progress honestly. One of the ways I used to keep my mind occupied during road marches in the Army was to calculate how times I had done something. For instance, I was marching around Korea in 1980 and calculated I had already spent well over 1000 days in the field. That is one reason I have not the slightest interest in camping. At that point, I was about 1/3rd of the way through my career. I stopped counting after that. Tonight’s exercise was figuring out the extent of my measured shooting performance when others were watching. There are two quantities I can calculate; IDPA stages shot and demos in front of classes I have taught. Roughly, I shot about 200 stages a year for the first 12 years I shot IDPA. Quite a bit less per year since then but I’m working on increasing it. So let’s say some 2500 stages where I’m in front of a group. Demos in classes would be Rogers classes and my FST classes. Rogers demos are grueling because the class oftentimes is looking for the instructor to screw up. I taught roughly 60 or so classes at Rogers. Probably at least 12 to 15, perhaps more, demos per day for 3 of the 5 days. So, let’s say 40 demos per class. That’s another 2400 exercises while I’m being watched and graded. Then we have my Firearms Safety Training LLC classes and seminars. I believe in demonstrating most of the drills for the students unless the drill is really simple. Over the course of 16 years, I’ve taught 4 to 6 classes per year, plus quite a few seminars. Let’s say 100 total classes and seminars with around 12 demos per, average. So another 1200 evaluations in front of a group. Overall, it looks like I’ve stepped up to the plate over 6000 times to stand and deliver while people are watching and, in many cases, waiting for me to screw up. The value of that much experience at problem solving and having to perform to a standard is incalculable to me. I wouldn’t trade it for anything and I feel sorry for those who deprive themselves of that opportunity. It’s a very valuable form of stress inoculation, readily available to anyone who wants it. But you have to be willing to fall on your face for awhile because I certainly did. First of all, let me say that I distinguish between ‘training’ and ‘practice.’ Training is something you do with someone else’s guidance and, hopefully, observation, if it’s a physical skill. ‘Practice’ is something you do on your own. Training, therefore, is generally structured by the trainer. However, you as the individual decide what training program you choose to undertake. Practice, on the other hand, is generally structured by an individual, although it may include a program set up by a trainer. In either case, we have to establish our priorities of what our program is going to be. That can be a more involved process than we realize. It’s easy to be sidetracked either by what we enjoy, regardless of its relevance, or by what others tell us is significant, without establishing its importance in our skillset. The first shooting by an Illinois Concealed Carry License holder provides an example. It’s great that he was able to run off his attackers. It’s not so great that he launched several bullets that missed the criminals and ended up who knows where in a densely populated urban area. We really can’t hope that the “Big Sky, Little Bullet” concept is going to work out for us. How much different is that than ‘celebratory gunfire’ that sometimes has tragic consequences? Not much, in my opinion. At the end of a recent Handgun Fundamentals course, I was asked “where do we go from here?” For the person who has recently acquired a pistol for defense, a good start is the NRA’s Defensive Pistol I Courses of Fire. It is a well structured and incremental approach to skill practice. It is self paced and can be shot on your own. For the person new to carrying a weapon, the NRA Defensive Pistol II Course of Fire is an excellent regimen. Most State Weapons Carry Qualification Course don’t require drawing from a holster and many forbid it. The NRA course provides a standard that those who carry weapons should strive to be able to meet. What I like about it most is that it is a 100 percent standard, not 70 or 80 percent like a qualification course. We need to accustom ourselves to the concept that if we shoot at a criminal, ALL the rounds we fire must hit the target. That’s being responsible. The initial NRA DP II standard is to hit within the 8 ring of a D-1 target at seven yards with one shot in five seconds. The Pro-Marksman rating requires this to be done 20 times. The 8 ring is 12 inches in diameter. I personally prefer to tighten the standard to the 10 ring, which is 8 inches in diameter. If practicing from the high ready, the time standard needs to be cut down to something like four seconds, which is still very generous. 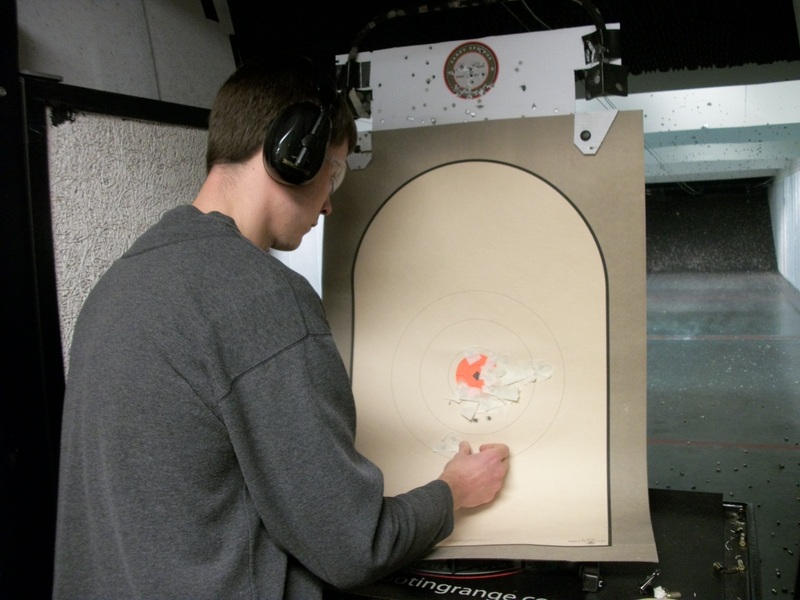 Once shooters meet the initial level (Pro-Marksman) of the Defensive Pistol courses, they can work their way up the succeeding levels of the Program. Whatever practice priorities you may choose, NRA DP or other, make a conscious decision about them. Just because you read in a gun magazine, on the Errornet, or I say it’s the thing to do, doesn’t mean it’s right for you. Look at what happens to people in your walk of life and think about your lifestyle. Then adapt your practice priorities to your life.